Pedestrians wait to be able to cross Jefferson and continue south on Central along the sidewalk. Sahra Sulaiman/Streetsblog L.A. Listening to the City Planning Commission vote in favor – albeit somewhat reluctantly – of moving forward on the regressive amendments to the Mobility Plan 2035 this morning, I felt my heart sink. The amendments to the Mobility Plan that the City Planning Commission recommended the City Council adopt. Worse still, it was all happening in the guise of greater “safety” and mobility as defined by people who appeared to care very little about either for people other than themselves or their own narrow interests. That hypocrisy was perhaps best exemplified by the Westwood contingent of homeowners who now were masquerading as bus huggers. Which was truly bizarre, considering that just last year, when Fix the City and their Westside supporters launched their lawsuit against the Mobility Plan, they were decidedly anti-transit and anti-options in their approach. The group’s president had ranted about how the city “want[ed] to make driving our cars unbearable by stealing traffic lanes from us on major streets and giving those stolen lanes to bike riders and buses.” Laura Lake, the group’s secretary, had told the L.A. Times that safer streets and more transportation options could only lead to greater tailpipe emissions, greater congestion, first responders getting trapped in traffic more often (implying more death and destruction), and greater sacrifices made by people whose schedules would be so disrupted that they would lose untold hours that would otherwise have been spent working or with their families. Today, Lake had completely changed her tune. Now she was telling the commissioners that she was deeply concerned about the more than 900 buses traveling along Westwood every day. If those buses were to get stuck behind a bicyclist, she posited, thousands of bus riders could be impeded from getting to work or school. Other Westwood advocates that stood to speak took their lead from the backwards logic regularly deployed by Councilmember Paul Koretz regarding bike lanes, arguing busy streets with no bike infrastructure were dangerous for cyclists and therefore better infrastructure must be avoided at all costs. Barbara Broide, another Westwood HOA president, argued bikes on Westwood would deter people trying to connect to the Expo Line via bus and wondered how people could possibly feel safe riding bikes alongside hundreds of buses anyways (which of course they don’t, which is why they have clamored for the bike lane). Stakeholder Debbie Nussbaum warned against bike lanes on busy streets in general, proclaiming they ran the risk of giving people a false sense of security. The nonsense was too much for Sean Meredith – a commuter who, unlike those that had just spoken, regularly cycles through the area. Westwood provided a direct route to the Expo Line, the most direct line to UCLA, and was actually the safest route, he said, explaining the more narrow nature of the substitute streets and the many parked cars there made for poor visibility and more unsafe conditions for cyclists. If you really want buses to be able to travel Westwood freely, he argued, put in a bike lane so the bikes can get out of the way. His comments were echoed by UCLA planning analyst Michael King, who also argued that while adding in substitute corridors to the BEN was fine, removing them from the Plan was counterproductive. Bonnie Bentzin, UCLA’s deputy chief sustainability officer and also a bike commuter, reiterated her support for a Westwood bike lane, reminding the commission that the decision to substitute Midvale and Gayley for Westwood had been made without any investigation into whether they provided a viable option in the first place. Speaking in perhaps the plainest terms, LMU professor and bike commuter Michael Brodsky argued there was no point in implementing lanes that cyclists would not use just because politicians preferred them. The Plan, he stressed, was about making transportation safer and more accessible for everyone, not just motorists. And streets that were safer for bikes were, by default, safer for pedestrians, motorists, and everyone in between. The idea that lanes should go where people are most likely to use them – and actually need them – applies nowhere more clearly than along the 7.2 miles of Central Avenue linking Watts to Little Tokyo. 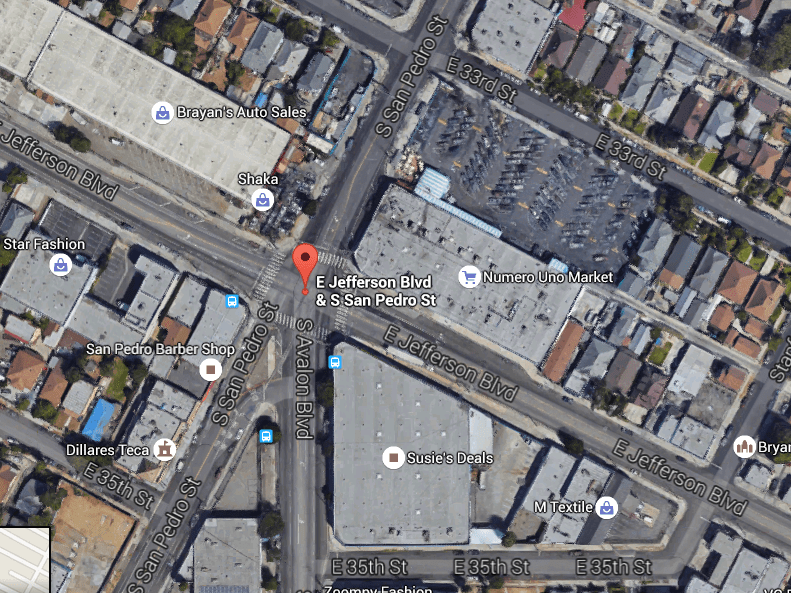 As Jefferson High School student Adalberto Juarez explained during his testimony, the city needed to understand that a lot of the people using Central Avenue were families who were desperate for healthier options. His family had a history of diabetes, he said, and his dad wanted to do things like take Juarez’ sister out on his bike, but often felt that the risk was just too high. Moreover, Juarez continued, many of the people using the street were unaccompanied kids whose mothers regularly sent them on quick errands. Their trips were hyper-local and patronized local businesses, making it highly unlikely those kids would go two full miles out of their way just to go 3/4 of a mile up the street and back. Instead, that kid would be more likely to ride on the sidewalk, as the vast majority of cyclists do now. And if Councilmember Curren Price goes ahead with his plan to expand the sidewalks – as is likely, given his and the city’s top-down approach in the Great Streets planning process, the mayor’s February, 2016, letter of support for South L.A.’s Promise Zone touting the creation of a pedestrian zone, and the request that most of the length of Central be made part of the Pedestrian Enhanced District – we can expect that sidewalk riding will continue to be a staple on the avenue. What she didn’t want, she said, was for the people of South Central to have to continue to adjust to being given amenities that did not fit their needs. 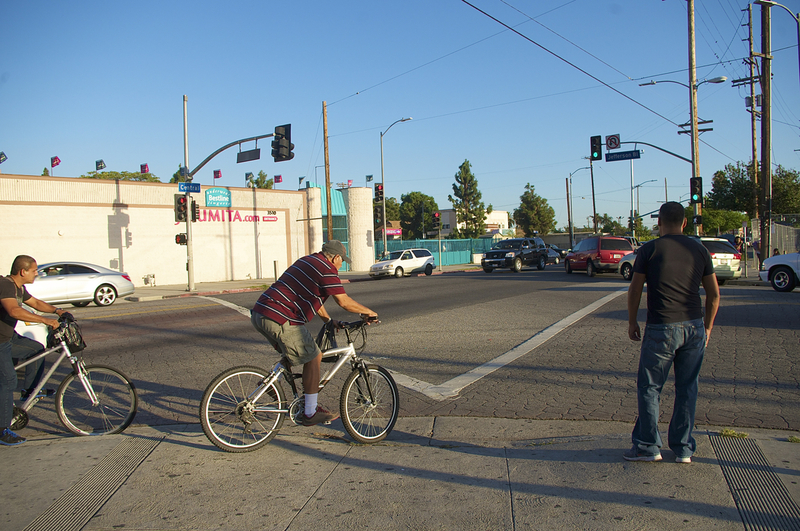 She and Juarez had conducted surveys as part of their work with the National Health Foundation and they had found that bike lanes along Central Avenue were seen as part of a healthy community and as infrastructure that could protect friends and family. Many of the commissioners, it appeared, did not disagree. As they weighed the testimony against the amendments, questions arose regarding the “removal” of lanes from the Plan. Would removing them now preclude those corridors from being subject to study for bike lanes in the future? Satisfied that this meant that the amendments did not significantly alter the Plan, and wishing to have the Plan finally see the light of day after all of these delays, the commissioners voted to recommend that City Council adopt the network and text changes to the Plan outlined here and that the City Council adopt the changes to the BEN and PED as outlined in the Staff Recommendation Report. Renee Dake Wilson was the only commissioner to vote “no” with regard to recommending adoption of the network and text changes. But several others, including Robert Ahn, Dana Perlman, Samantha Millman, and Veronica Padilla-Campos, expressed their support for the original plan to put bike lanes on Westwood and Central and reiterated that their willingness to sign off on the changes was linked to the ability of planners to revisit the “removed” routes in the future. UCLA students who live in Westwood should make sure they are registered to vote in Westwood. That might tip the balance of power away from the local homeowners. That neighborhood would benefit tremendously from calming traffic on Westwood Boulevard. It’s already an area where lots of people are thinking outside the car. With the subway coming, that should only increase. I don’t understand the political dynamics on Central, but I hope local people make their voices heard in favor of the bike lanes. I think the safety pitch is actually really compelling, even for people who mainly drive, if you get them to think about the value of driving fast versus saving lives. If I have to bike to UCLA or up Westwood for another reason; I almost always ride on the sidewalk in this area without the bike lane. I know the dangers of sidewalk riding, but I still feel it’s safer for me than riding on the street in this area, especially if I have a kid in my big, sidewalk clogging, cargo bike. The politics on Central are a challenge. Price is catering to the interests of the business owners at the expense of the community of commuters. It’s all made more complicated by the fact that the business owners in question are largely African American and the commuters are Latino, and often immigrants. I completely understand the desire to support the business owners. There are so few corridors with black-owned businesses and that area of South Central has a very special place in black history in the city. There absolutely needs to be investments made to celebrate that and ensure that those businesses survive and thrive as the city grows southward. But there has to be a better way than the one Price and the mayor’s office have put forth, which totally disregards the safety needs of the Latino community (which now comprises about 80% of the neighborhood). There has to be more of an effort to balance needs and celebrate the contributions both make to the community, but I’m not holding my breath. Thanks for clarifying. It’s puzzling that Price is totally ok with a road diet, just as long as it doesn’t add bike lanes. I say go ahead and make wide sidewalks, maybe a future councilmember will be able to make it a shared sidewalk with paint separating the “bike” side of the sidewalk and the “pedestrian” side of the sidewalk. And for those brave enough to take the street, at least the slower traffic will make them safer. Not ideal, not by a long shot, but Price’s plan will slow traffic and accommodate sidewalk riders, so in a way he’s making things better for bikes without trying. Equally puzzling is Koretz opposing bike lanes that literally will not remove anything, parking or lanes. Throw in the fact that the type of facility he and his HOA pals are opposing is almost exactly identical to the bike lanes Koretz supported on Santa Monica Bl in West Hollywood when he was a politician there. I would sort of agree with you, except that, as laid out by the Great Streets program, the sidewalk reclamation would be more like Broadway – not actual sidewalk extensions. So you’re just taking up space, but it will be kind of dead space, meaning that cyclists will still be riding on narrow sidewalks. Which would completely thwart the goal of creating a pedestrian-friendly district. Even when the sidewalks are widened (if that should happen), Price was opposed to striping some sort of bike path on them. I am not sure where he thinks all of those commuters are going to go. It’s just dumb. And the mayor’s willingness to go along with it makes it all the worse. Streets are not Great if they are not accessible to the very people that need them most. *agree with you regarding Central, that is. Sorry. forgot to clarify which street i was talking about! “Would removing them now preclude those corridors from being subject to study for bike lanes in the future? Quite frankly, sometimes I get utterly frustrated when the bike plan is used to justify NOT building bike infrastructure. Yeah, this! Something being in the plan doesn’t mean it will get built either, as is clear by the City’s unimplemented Bike Plan. Basically something will be built when political will is there, so Koretz and Price were in no danger of seeing bike lanes anytime soon. I cross Westwood Blvd twice daily, 5 days a week on my commute from Hollywood to my office in Santa Monica. The way the lights are timed I always have to stop at the light on SM Blvd and Westwood. Without fail, every single day, I see 4-5 cyclists edge-riding that street in both directions. I have ridden it a few times myself and even though I ride VC and take the lane on Santa Monica Blvd, I end up edge-riding that stretch on Westwood too because I cannot maintain enough speed to compete with the speed demons blazing up and down that street. It’s a very intimidating road. If experienced, trained vehicular cyclists don’t feel safe riding there one can only imagine what the average student or novice cyclist must feel while trying to ride. One thing I do know is that the number of cyclists I see riding Westwood seems to be increasing over the last few years – at least that has been my observation. 5 years ago I would go days without seeing a single cyclist traversing it. Hilariously, the Westwood HOA people claimed to have talked to barbers and other businesses on Gayley that they said would be thrilled to have the extra bike traffic and potential customers. It was all too much. They co-opted basic livability/safety/mobility language to use it against livability/safety/mobility. The commissioners genuinely sounded bummed about this. But wanted to see the plan implemented at some point before 2035, so they passed it along. We’re willing to let our neighbors and friends get killed or maimed in the streets so that Councilmember X will not have an awkward conversation with HOA President Y. Imagine if we had similar arguments about hand rails on stairs while every year people fell off the sides of staircases; studies piled up about how to fix the issue without affecting the mechanics or flow of travelers on the stairs; community health studies were done to show the negative effects of stairs with no hand rails; property values were measurable lower due to to unsafe staircases. But some confused people who have the ear of Councilman Q demand that they like stairs without handrails because it makes them feel important while they walk around in their huge mascot suits forcing everyone else to either plunge to their death or get out of their way. So we have stairs with no handrail, because transient, trivial, local political winds blow against the safe, inexpensive, reasonable, rational, objectively better option. 2016 and all the years hence: get those winds blowing in the direction of safer streets or be prepared to watch the low level holocaust on our streets continue unabated. The exact same bizarre “logic” was used at every single bike lane meeting I attended for both North Figueroa and Colorado Boulevard. I have heard it repeated at numerous other public meetings when cycling is brought up. It’s part of the canon of stupid things people say when prompted to speak about bike lanes. The more important thing to focus on is: will our elected leaders back safer streets or those with warped perceptions who spout the above nonsense? “Support the business owners.” is what the business owners and Price will claim but do any of these business owners know who is shopping at their own stores? How many people are arriving on foot, on a bike, via transit, or in car? Everywhere I’ve seen a street like Central surveyed, the split is approximately 75% non-car customers to 25% car driving. I don’t see too many big box retailers on Central. I don’t see too many huge lots on Central. I see the same old street car commercial strips that you find all over LA along old street car streets; mostly frozen in time by economics and moronic planning laws. The same platitudes about “business” are just being trotted out, once again, to keep a street dangerous in service to the feelings of a few connected people who are afraid of not being the most important person at the heart of every land use and transportation planning decision in their luxury sedans and SUVs. I do not understand the insistence planners and advocates have in applying stock assumptions and arguments regarding mobility patterns to lower-income communities of color. The mobility dynamics are very different in South L.A (and bikes tend to signal poverty, not “business,” as advocates are fond of repeating). Especially when you are looking at black-owned businesses… there are not all that many, and many have a long history in the community. And Central means something to people. So along Central (like along Crenshaw) the customer base is often loyal and comes from all over the city and county to patronize them. Other businesses do indeed serve a more local population. But the mix means a variety of needs and modes should be taken into account when planning for the future of the street. And I think that that is OK. It doesn’t mean there is no place for a bike lane, but the engagement on the bike lane was so poorly done starting a few years ago and then again when Great Streets stepped in and decided for the community that there would be no lane, that this outcome for Central was almost inevitable. I ride the sidewalks all the time, especially on Santa Monica Boulevard. I feel like I’m trading the continuous risk of being doored or rear-ended with the punctuated risk of being sideswiped or hooked at intersections. Sidewalks feel safer, really. For that matter, I’m curious whether the studies have controlled for confounding factors like experience and age. By now, we’re very used to bald assertions that supporting cars and shunning bikes is good for “business”, and it’s repeatedly turned out to be false. So pardon us if we don’t believe it when it’s claimed, *again*. The burden of proof is on anyone who claims that business “depends” on car traffic, and in this case the burden hasn’t been met. So the only businesses who have actually been asked (those on the nearby street) think bikes are great? And the only people coming out against bike lanes are NOT in fact businesspeople, but HOA members? Seems to me it isn’t the business lobby who cares here — they’re just being used as a stalking horse. Why does this even *work*? I understand why politicians react when actual business owners complain, but when they are just being used as a stalking horse, seriously, why? Yes, you did read that about the Westwood HOA people because I seriously doubted that any one of them would have gone door-knocking along Gayley for the sake of a bike lane. Maybe they did. But it seems somewhat suspect. The conditions in a well-to-do area vary greatly from those in a lower-income community of color. I don’t think that is particularly hard to understand. Nor did I say that such conditions precluded a bike lane from being run along Central. And I did not say that the businesses themselves were wholly against a lane (some are, others were not, and others were never asked by Price because such a thing might run against his interests). The reason I mention all these things is because nuance and complexity matter when you are engaging communities. There is absolutely no sense in beating lower-income communities of color over the head with mantras like “bikes mean business” and data drawn from examples in well-to-do and gentrifying communities when they have little to do with the realities those folks are facing. Or, that is exactly what they fear – that bikes will gentrify their neighborhood and they’ll be pushed out. Again, it doesn’t mean bikes and bike lanes are not workable solutions for those communities, especially because so many folks do rely on bikes. But to have that conversation, you need to meet communities where they are instead of just assuming that one reality fits all. One reality does not fit all and behaving as if it does tends to be alienating and do more harm than good. I would go patronize Central more often if there was a bike lane. I don’t go there as often when I have to walk or take the bus. But it’s typically short sighted to only see the people who complain about a narrow road and not see the majority who would come more often if they had a safer way to get there. Stock assumptions about foot traffic at walk-up retail are stock assumptions because across many different cultures and ethnic groups, people follow very predictable patterns when it comes to patronizing walk-up retail. If there is a weekend shopper component keeping various small businesses open, this is no different than Artesia’s Little India with heavy outside traffic during certain periods during the week but little but walk-up traffic during the normal week days. Shuttles, bicycle taxis, and numerous other improvements can maintain or increase that weekend traffic AND allow for calmer traffic and better road conditions. I think the dialogue that makes this “business vs. safety” is a narrative for stasis or for failure on numerous public health and community safety goals, as well as a refuting of the fundamental promise of city life.